Session 20: Pastry Doughs began with learning how to make the basic pastry doughs -- a regular one and a sweet one: Pâte Brisée ("Broken Dough" Pie Pastry) and Pâte Sucrée (Sweetened Pie Pastry). Both involved sifting flour and salt together, directly on a work surface (for the sweetened one, you add sugar as well as salt). Then, you add small pieces of unsalted butter (of course) to the sifted ingredients and, using your fingertips or a pastry scraper, work it into a sandy textured mixture with no butter lumps (sabler). Then, you form a well in the center of that and pour a mixture of egg and water into it. Quickly, and carefully incorporate the liquid into the flour/butter mixture just until the dough holds together. 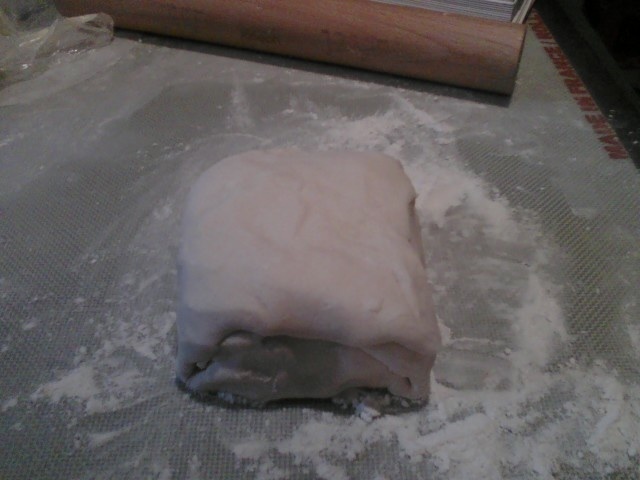 (You can add ice water if necessary to aid in this, but don't add too much liquid or you'll have a sticky, tough dough. Don't overwork the dough, but get rid of any lumps by pressing them back into the dough with the heel of your hand (fraisage). Then, gather the dough together and form it into a ball, wrap it in plastic film and chill for about 30 minutes before rolling out. I looked ahead and saw that I would be making four recipes that used the pastry dough, so I made all the dough at once and froze half. My first tart was a Tarte à l'Oignon (Onion Tart). The book called for a 8" flan ring for these recipes, and after much searching, I found something called a pastry/quiche ring, so I went with that. And, since I made the first two recipes in the same evening and would be putting both in the oven together, I also used a tart pan I had in my pantry. Both seemed to work fine. I rolled out the dough into a 9" circle, folded it in half and place in the floured/buttered ring (which had been placed on a buttered circle of a baking sheet) and left excess dough on the edges to account for shrinkage and a decorative edge, and then returned to the fridge to chill for at least 30 minutes. For the filling, I cooked lardons in a pan over medium high heat, transferred them to double paper towels to drain, and then added some butter to the bacon fat and once that was heated through, about 14 ounces. (about 4 medium) of onions that had been thinly sliced (émincé) and stirred them frequently with a wooden spoon for about 30 minutes, until they were a lovely golden brown, soft, and had caramelized. I seasoned with some salt and pepper, and set aside. Then, I took the pastry shell out of the oven, placed some parchment paper in the middle, filled it with an even layer of pastry weights and baked in a 400 degree oven for about 10 minutes, until the dough was dry and white. Then, I took out the paper and weights and continued to bake for another 15 minutes until the dough was light brown and and cooked through (cuire à blanc). I set the shell aside to cool and finished the filling. I combined an egg yolk with an egg until well blended, and then added whole milk, heavy cream, salt, pepper, and freshly grated nutmeg, whisking gently so as not to create too much air (which makes bubbles). I put the onion/lardon mixture in the pastry shell and then poured the egg custard mixture over it, filling the shell completely. Then, I baked in the oven for about 20 minutes before removing the ring, and lightly coated the crust with an egg wash (made from an egg and heavy cream) before putting it back in for about 10 minutes more, until the custard had just set (don't let it puff up or it will become dry). I removed from the oven, let cool for a few minutes and took a big bite. It smelled great and the custardy filly was really good. This would be a nice autumn evening meal with a salad and glass of wine. But too heavy for a 98 degree hot July day. Next was Quiche Lorraine, and I definitely learned something new here. I usually put at least 4 eggs in my quiche -- but for this recipe I basically used the same custard from the onion tart, with some coarse salt, cayenne pepper and nutmeg mixed in. I went through all the same motions as the first recipe, up to the cuire à blanc, and from there, I spread grated Gruyère cheese and lardons in the bottom of the pastry shell, then poured the egg custard over the filling before baking at 400 degrees for about 20 minutes, pulling out to cover with the egg wash (I was using a quiche pan, so didn't need to remove the ring like in the previous recipe) before baking for another 10 minutes or so, until just set. I removed from the oven, let cool for a few minutes and then cut into wedges. The result was a pillowy, fluffy, eggy dish that put anything I've ever made in that realm to shame. I will definitely remember this recipe the next time I make a quiche. Yum. Next, using the sweet dough, I made un/an Tarte aux Pommes (Apple Tart). This one was a bit of a mystery to me. First, they call for yellow delicious apples, which I think are the least flavorful, especially for baking, and I was to peel and cut about 2 1/4 lbs. into cubes, add to a pan with some lemon juice and sugar and cook until the water is removed from the fruit--but the apples weren't allowed to break down, so I wasn't sure how nice that filling was going to be. Once that compote was made, I put it into the bottom of a chilled, unbaked sweetened pastry dough that had been rolled out and readied like the other two recipes (but not baked). Then, I peeled and sliced about another 2 lbs. of apples and placed in concentric circles/decorative pattern to cover (rubbing the pieces with lemon so they wouldn't color. I brushed the top with melted butter and then it went into the oven, starting on the bottom rack for 10 minutes at 425 degrees, then down to 350 degrees for about an hour, until golden brown. When it was removed from the oven and had cooled a bit, I brushed it with an apricot glaze made from apricot jam and water that was then strained. I let it cool completely, and that was it. It looked pretty, but it didn't taste terrific. I wanted desperately to add some cinnamon or sugar or something to perk this up. Or, maybe it just needed some vanilla ice cream? My next treat was un/a Tarte aux Poires à la Frangipane (Pear Tart with Almond Cream). This one, I liked. While the pastry cream cooled, I made the almond cream by placing room temperature butter in a small bowl and beating it with a wooden spoon until light and fluffy. Then, in went some sugar and I continued to beat it until it had a smooth consistency. I added in some almond flour (try Whole Foods, specialty food stores or Amazon.com) and mixed that in to combine, being careful not to over mix as that would give it a paste-like texture. Then, in went two eggs, one at a time, and then I set that cream aside, too. I assembled the tart by combining one part pastry cream with three parts almond cream to make frangipane (you could also do one part pastry cream and two parts almond cream, but I wanted that nice almond flavor to come through). I had sliced eight canned (in fruit juice) pear halves beforehand -- the book says you can use fresh or canned and I had some in the pantry, so went with that-- so I filled the pastry shell with the frangipane and topped with a thin layer of pears, arranging in a decorative pattern. I baked at 350 degrees for about 30 minutes and then moved to a wire rack to cool slightly before brushing the surface and crust with the apricot glaze. The almond flavor was really great, and the pears were slightly crunchy so made a nice contrast to the custardy filling. Yum and yum. Moving on, I tackled Pâte à Choux (Choux Pastry/Cream Puff Pastry) and used it to make Choux à la Crème Chantilly (Cream Puffs) and Éclairs. Basically, you combine water, salt, butter cut in chunks and sugar in a pot over medium heat and bring just to a boil. Then, you remove from heat and beat in flour, then return to medium heat and beat for about 30 seconds more until the mixture forms a dry mass and pulls away from the pan. Lower the heat and stir for another minute until the mixture seems dry and then remove from heat. Scrape the dough into a clean bowl and then beat in 4 eggs, one at a time, incorporating each into the dough before adding another. Continue beating the dough until all the eggs have been added and the dough has a smooth and shiny texture and forms a ribbon when lifted out of the bowl with a spoon, or when you run a finger through it and it leaves an indent that slowly fills. Transfer the dough to a pastry bag fitted with a plain top (I learned the hard/messy way to fold down part of the bag, fill it to that point, and then unfold -- otherwise when you squeeze the bag, the filling comes out of the top and the bottom. For cream puffs, you should pipe into small rounds (onto parchment lined baking sheets) and for éclairs, pipe into elongated shapes (about 4 x 1 inches). Once piped into the desired shapes, brush gently with an egg wash made from an egg, heavy cream and pinch of salt, and then bake at 400 degrees (350 degrees if you have a convection oven like me) for about 30-40 minutes, until the pastry is golden brown and has puffed up. Then, lower the temperature to 300 degrees, open the door a bit and let the pastries sit and dry out for about 10 minutes more (if you have a convection oven, just turn it off and let them rest with the door closed for 10 minutes). The pastry should feel light and hollow -- if so, remove from the oven and let cool on a wire rack for about 20 minutes. For the cream puffs, I prepared as above, then once cool, cut them crosswise into equal parts and then piped in Crème Chantilly (Sweetened Whipped Cream) which was made from pure vanilla extract heavy cream and confectioners' sugar into the bottom half, topped with the other half and then dusted with powdered vanilla sugar I had picked up at a spice shop. Pure heaven. For the éclairs, I baked as above, then made two small holes in the top of each, piped in pastry cream (similar recipe to the one in the almond tart) then dipped into some Fondant icing (prepared fondant, simple syrup and a dash of vanilla) and put in the fridge to chill. It was so hot in the kitchen, the fondant turned into a glaze ... but you get the picture. Baked goodness. Chris said he didn't think they could be any better and proclaimed them "terrific," "delicious," and made some of those groaning sounds that mean "this is to die for." Note: It's important to fill both of these desserts right before serving, otherwise they get soggy, so I made it part of the fun -- we each piped in whatever we wanted inside. Lastly came Pâte Feuilletée (Puff Pastry), which starts by making a détrempe. I sifted flour and salt together on a cool work surface, and using my fingers made a well in the mound and then ran a finger through the center of the ring to make a channel. 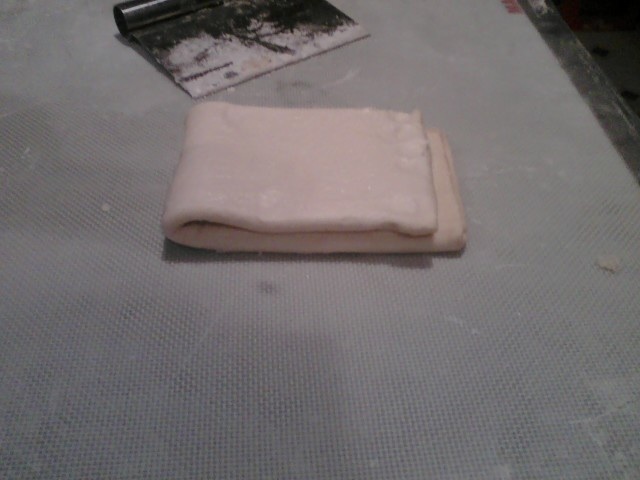 Next, I poured in cool water and worked it into the first ring of flour to make a paste. Then, I added in some melted butter and using my fingers and a pastry scraper, worked the butter into the paste. Soon a rough dough formed -- I shaped it into a square block and then cut an X down into the top half of the block (helps cut the gluten strands) and wrapped in plastic wrap and then chilled for at least 30 minutes. When the dough was almost done being chilled, I made the beurrage by taking 12 TBS of chilled butter and placing it between two sheets of plastic wrap. I must say this one was quite a challenge considering how hot the kitchen is and how hot it is outside (mid-90s). Traditionally, you put the dough in the fridge for about 30 minutes between the turns -- I had to wait an hour between each because the dough would get soft so quickly. But, I persevered and it looks pretty great. I will put it in the freezer and use it for a fruit tart in Session 21: Creams and Custards.